Quality & Style inside & out! This 4 bedroom, 2 bath, 3 car garage home sits on a huge private lot. The open flowing floor plan makes it a great home for entertaining. The roomy gourmet kitchen includes breakfast nook, lots of corian counter space, stainless steel appliances, recessed lighting and a great breakfast bar which opens to a spacious greatroom. The spacious master bedroom has a fantastic master bath with double sinks, corian counters, separate garden tub and shower. The greatroom leads to a huge covered screened lanai. The yard backs up to a large pond and lot's of woods for complete privacy. Other extra features are built in swimming pool and hot tub, internet and phone in every room, convection microwave, water softener and purifyer, all appliances are to remain with the home as well as the washer and dryer. South Fork is a beautiful planned community with 2 pools and a playground. 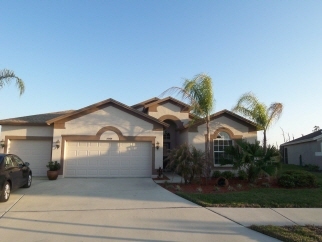 Minutes to MacDill A.F.B., shopping and great beaches. Easy access to I-75 and the Crosstown Expressway.